We are at game changer number 42, April Bloomfield. This is were we chronicle Gourmet magazines 50 women game changers in food. This is the brain child of Mary over at One Perfect Bite. April Bloomfield as born in 1974. Her step father was an engineer. Her mom made pillboxes for an enamel company. At sixteen she decided she wanted to be a policewoman. She was to late for the entrance exam so she decided to follow in her sisters footsteps. She enrolled at Birmingham’s College of Food and from there she took off. Her first job was in the roast section of the Holiday Inn. She then worked at Brackenbury. That is where she mastered all her pub classics. She then moved to the french bistro Bibendum. In 1999 she started at the River Cafe. She was there for four years when she got a call from friend and chef Jamie Oliver. He wanted her to interview for a new chef job. Once getting the job at The Spotted Pig, she and her partner set out getting things ready for the restaurant. That summer she went to Chez Panissee acquainting herself with American ingredients. In 2009 she started another restaurant called The John Dory. It closed in less than a year. Her next venture was another restaurant called The Oyster Bar. Only time will tell how well this restaurant will do. I decided to do her deviled eggs. Place eggs in a single layer in a medium sauce pan. Cover with 2 quarts cold water. Place over high heat and bring to a boil. Shut off the heat and remove saucepan way from heat.. Wait 18 minutes. 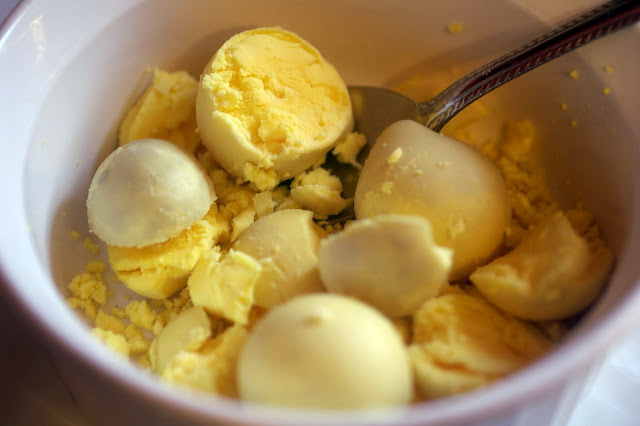 Drain eggs and add more cold water to saucepan. 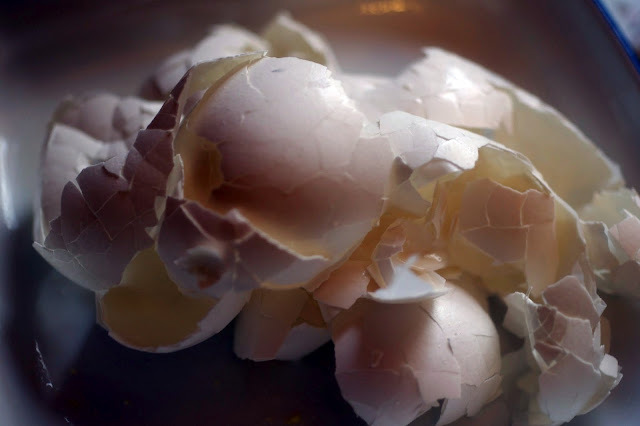 Remove each egg one at at time and peel. 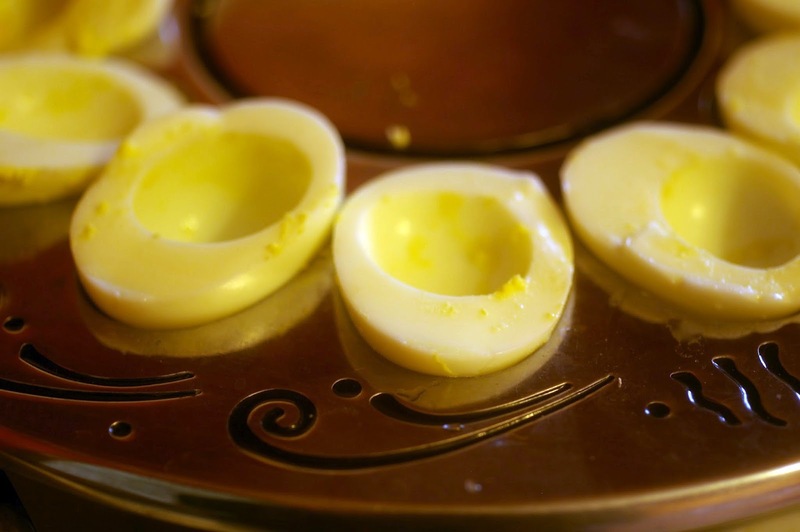 Place egg yolks in a bowl. Add olive oil, mayonnaise, mustard and vinegar. Mix until smooth. Season with salt. Transfer mixture to into empty egg whites until overflowing. Sprinkle eggs with Maldon salt and chives. Drizzle with olive oil and serve. The following bloggers are also featuring the recipes of April Bloomfield today. I hope you’ll pay them all a visit. I love to see what they bring to the table. One Perfect Bite, to get additional information. April Bloomfield makes even a classic stand out. These look beautiful! I love April’s approach – simplicity and flavor. YUM! Wow Veronica, while I am inspired by April’s recipes and this one does sound wonderful, I am truly moved by your beautiful and artistic photos! April know what flavors to choose and to make them shine. This is no exception – these deviled eggs look extraordinary and now I am wishing for some. What an artistic and beautiful photo. It’s almost too pretty too eat. I said almost; I’d still go for it! Your eggs look great…I actually loved this recipe…so delicious! Love your first photo…beautiful! Such a pretty presentation. So interesting that April uses two different vinegars in this recipe. Oh my goodness – love the presentation. I’ve got to get me some pretty kitchen tools! 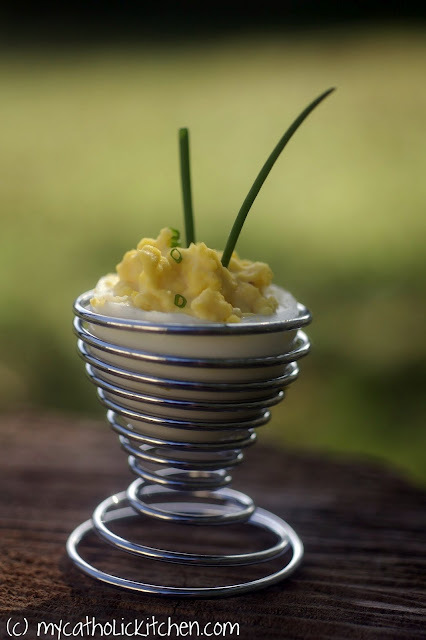 Love how you presented your deviled eggs. How creative you are! These look and sound delicious. How interesting that the recipe calls for malt vinegar. I only think of using it for fish and chips!! 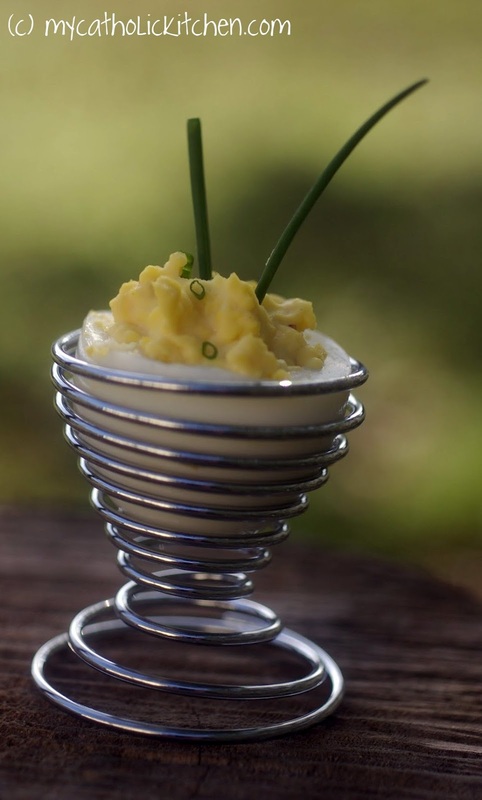 I have never seen prettier deviled eggs… I just made them for easter they didnt look half this good! I’d never heard of April but I do like the look of those little devils!